The study abstract, "Too Cool for School: Examining Portrayals of Academics in Children's Television Programming," will be presented Saturday, Nov. 3, at the American Academy of Pediatrics 2018 National Conference and Exhibition in Orlando, Fla., documented how academically-focused activities and traits are shown by characters in popular children's television programs. 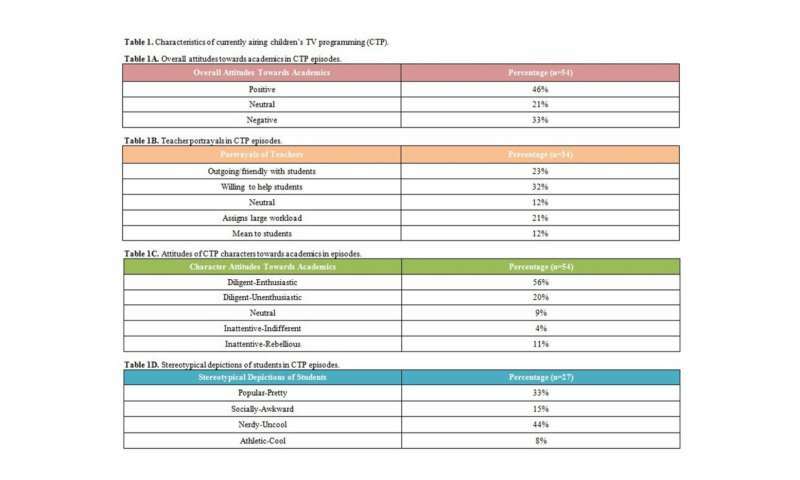 Program ratings were used to identify the 30 most popular children's TV shows, and two 30-minute episodes of each program were then picked at random. Researchers examined how the shows portrayed school life and classes, how teachers were portrayed (friendly, mean, willing to help students), how the characters approached school, and stereotypical student depictions (popular, nerdy, rebellious). Overall attitudes toward school were 46 percent positive and 33 percent negative. Teachers were portrayed in a negative light 33 percent of the time, while 59 percent of students were characterized as either "nerdy-uncool" or "socially-awkward." Shows targeted to younger viewers tended to show enthusiastic learners with a positive approach to school. But as the recommended viewing age got older, the overall portrayal of school became more negative. "Television content can have a profound impact on the psychosocial well-being and development of students. We do not want our kids to approach school with fear or be less enthusiastic about their future academic experiences," said Prithwijit Das, lead researcher at Cohen Children's Medical in Lake Success, N.Y., "Our hope is that parents, educators, and clinicians can get the conversation going about media awareness and support high-quality television programs that get children excited about learning." Since television is pervasive, these types of negative portrayals may have a long-term impact on the way children view their academic experiences and may impact their idea of academics and school for the future, according to the abstract authors. This study highlights the need to advocate for more positive depictions of academics and school in children's programming, especially as children get older, they said.